Again like previous solidarity demonstrations in the past few weeks, Israeli forces aggressively suppressed the crowd next to the checkpoint using skunk water cannons, firing tear gas, sound grenades, rubber coated bullets and live ammunition into the crowd of the demonstrators. The youth retaliated by throwing stones. 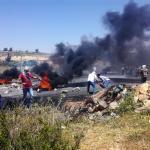 Demonstrators retreated to the hills and along the main road as they were chased by Israeli forces. From the play park next to the main road Israeli Forces opened fire with their snipers firing tutu ammunition at the demonstrators close to the main street. It was reported that eleven Palestinians were injured in this afternoon's confrontations, five people shot with rubber coated bullets, another five with live ammunition and one person with tutu ammunition. It is not clear whether the Israeli government will meet the demands of the political prisoners - Palestinians and the international community can only speculate. The Israeli defence minister Avigdor Lieberman tweeted that he would treat the hunger strikers the same way that the British Government treated the Irish hunger strikers. Israel has no interest in addressing the prisoners’ concerns, or take any implications if a prisoner should die. In fact, 36 years ago, in 1981, Irish hunger strikers died fighting for their freedom against the intransigence of the British Maggie Thatcher Government, who publicly refused to negotiate with political prisoners leading to their deaths. People are questioning if history will repeat itself, however on a much bigger scale. This leaves Palestinians with only one option: to resist, to demand and to fight for the rights of not only the hunger strikers, but the entire people. Is resisting until your humanity, dignity and basic rights are recognised not a basic human instinct? Let us continue to resist against the intransigence of Israeli apartheid policies and support Palestinians towards their journey to liberation.